By helping our client to overcome technical challenges we ensured that a new condensate refinery in Papua New Guinea could be run effectively by confident operational and maintenance staff. To view our other featured projects, please use the buttons below. Our client wanted to design and construct a condensate refinery in Papua New Guinea but they needed to achieve processing capability for limited capital expenditure, while being constrained by non-recourse financing. A lack of experience in developing and implementing downstream projects meant that the client had no established operating processes. Critically, there was an absence of experienced managers, while the scope of the project was unclear and the schedule unrealistic. In addition, the project depended on a high proportion of refurbished equipment that was prone to failure. Finally, contracts for crude oil supply and product off-take were required to secure project financing. We developed and implemented project management protocols for the scheme and helped the client to identify and structure effective feed product agreements that would meet the approval of project financing agencies. 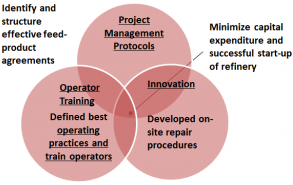 Our engineers defined best operating practices for the refinery and assisted in operator training. We also developed innovative on-site repair procedures which avoided the removal of key equipment from the site. This saved vast capital expenditure investment and prevented schedule slippage.